What (and where) is Hallstatt? 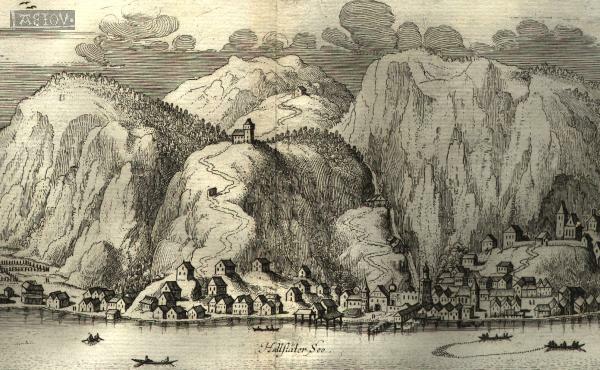 In 1824 came the first signs of the existence archaeologically of an important Iron Age cemetery at Hallstatt [also spelled Hallstadt], a small village in Upper Austria. Since much was lost about the Celts through the centuries, archaeology, just developing as a science in the 19th century, became a chief source of knowledge about the Celts in Europe. From 1846 until 1963, when excavations stopped at the cemetery, anywhere from 1000 to 2000 graves (My sources conflict) were excavated. The cemetery mostly dates to the seventh and sixth centuries B.C.E., and includes graves of many different classes. Warriors' graves made up only about a quarter of the Hallstatt cemetery. Women's graves tended to have masses of clanking jewelry and bulky fibulae. Rich graves in the cemetery often contained impressive sets of bronze vessels - buckets, situlae (buckets with rims turned inward), bowls, and cups, presumably imported from the Mediterranean. Hallstatt remains one of the richest known cemeteries of its kind, with a wide range of weapons, brooches, pins, and pottery. From these excavations, we can develop a comprehensive picture of who the early Celts were. 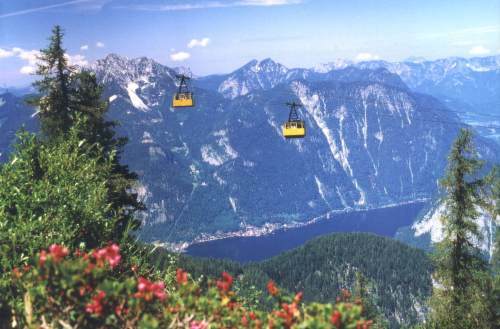 The individuals buried at Hallstatt came from an early Iron Age community, whose lives depended on the mining of nearby rock-salt deposits, an important commodity in those days for preserving food. Salt also effectively preserves organic remains. Investigations of the mines themselves yielded clothing, equipment and even the body of a miner, perfectly preserved by salt. Around 600 B.C.E. another big salt mine opened not far from Hallstatt, at Hallein (near modern day Salzburg), a site that was more easily accessible. Hallstatt then went into decline. From the 5th century on it had fewer and fewer well furnished graves. In the fourth century B.C.E., Hallstatt was devastated by a vast landslide. As stated in the Origins section, the Hallstatt culture, together with La Tène, represent archaeologically the iron-using prehistoric peoples of Central, Western and, temporarily at least, some other parts of Europe. 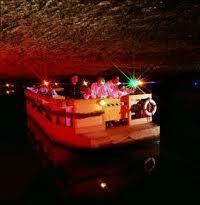 The Hallstatt culture is now thought to span a period from 1200 to 500 B.C.E.. From about 1200 to about 800 B.C.E. there is some overlap with the Urnfield culture as Europe was moving from the Bronze Age into the Iron Age. There are many similarities between the Urnfield and Hallstatt cultures, and it hard to determine when one left off and the other began. One thing is for certain, the first truly Celtic culture saw its beginnings in the Hallstatt culture. The Hallstatt era is divided into four phases: A, B, C, and D, by modern day archaeologists. Approximately, Hallstatt A and B correspond to the late Bronze Age, c. 1200-800 B.C.E. 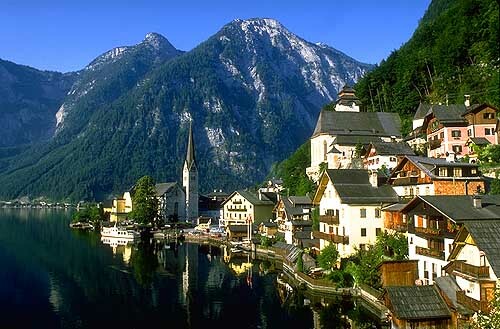 ; Hallstatt C refers to the very early Iron age, c. 800-600 B.C.E. ; and Hallstatt D ranges from c. 600-500 B.C.E.. During Hallstatt A and B there is an apparent lack of large scale political organization. Until the eighth century, the known settlements suggest no more than petty chiefdoms. It is during the Hallstatt C period that we start to see fortified settlements on hilltops north of the Alps with greater frequency. Consequently, many burial mounds mark the graves of the rising noble classes, who no doubt had the hillforts built. Increased trade volumes seem to have contributed to the rise of these nobles. In the last phase, Hallstatt D, the richest graves are more concentrated in the west than previously. Resulting, seemly from the wishing to be closer to trade routes to the newly founded Greek colony of Massalia (Marseilles), near the mouth of the Rhône. Reaching the Greek world via Massalia, stories about the 'barbarian' chiefdoms were in all likelihood one of the earliest sources for tales of the people called Keltoi. The fifth century B.C.E. began with a sudden extinction of the rich chiefdoms of the Hallstatt D. Hillforts all over Central Europe were abandoned, and rich burials ceased. At about the same time, wealthy warrior societies were developing, mostly to the north of the old Hallstatt centers. Almost certainly Celtic speakers, these peoples founded a unique culture and developed an artistic style unlike anything previously seen. This then is the developement of the La Tène culture.